Identification: The red-eared slider, a subspecies of the pond slider, is an aquatic turtle with a fairly flat, oval shell and a weakly keeled carapace. Colors range from bright greens and yellows in juveniles to more muted olives, browns, and even blacks in the more melenistic members. Two good field markers are the red stripe behind the eye for which the subspecies was named, and the pale yellow plastron with dark smudges on the scutes. Adult females can range up to 11 inches in shell length, with adult males rather smaller. Can be seen basking on logs and rocks on warm, sunny days, where they will pile on top of each other, then slide off at any sign of danger. They inhabit sluggish rivers, ponds, and lakes with soft bottoms and dense vegetation. Most people will recognize these as the "dime store turtle". Original Distribution: Mississippi valley north to Illinois and south to the Gulf; Tennessee and Cumberland river valleys from southeast Kentucky and southwest Virginia to northeast Alabama. Current Distribution: All original areas, plus west to New Mexico, east to Florida, north to New York, Pennsylvania, and Ohio, and south through Mexico, with pockets in lakes and ponds throughout the United States, Europe, and Asia. 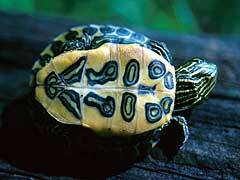 It has been reported to be the second most common turtle in Taiwan. Mode(s) of Introduction: Former pets released into local lakes and rivers. These turtles were widely and cheaply available in the mid 1900's, sold as hatchlings in dime stores and flea markets across the United States. Although most of these turtles didn't survive long enough to become a burden on their families, some of them did, and were then released into local waterways. When the law banning the sale of turtles less than 4 inches in shell length was passed, this in no way stopped the sale of the red-eared slider above 4 inches, and the problem of outgrowing their welcome persists into the present day. This is an ongoing issue, and has resulted in the establishment of many local colonies across the United States, Europe, and Asia. Reason(s) Why it has Become Established: The red-eared slider turtle is very highly adaptable, up to and including the ability to hibernate during the winter. Its original range included areas northern enough for this to be a necessity, and therefore it can survive moderate winters. This species can also tolerate brackish water, and thus survive in coastal waterways. They eat anything from fish, frogs, and insects to vegetation and bread thrown to ducks, and are more aggressive, and less shy, than native species. They were also introduced over a long period of time, increasing the likelihood of establishment. Ecological Role: This turtle, as stated before, is omnivorous in the extreme. When young, it tends to be more of a carnivore, eating insects, worms, tadpoles, small fish, and even carrion; adults tend more towards a vegetarian diet, but won't turn down meat if they can get it. Thanks to their size, bite, and thickness of shell, and adult red-eared slider has little to fear from predators, as long as alligators and crocodiles aren't around. The same cannot be said of their young, however, which are eaten by a variety of predators, including raccoons, skunk, fox, wading birds, and storks. Raccoon, skunk, and fox are also egg predators of this species. The young do, however, have an unusual protection against predatory fish; when swallowed whole, they hold their breath and chew on the fish's stomach lining until regurgitated. Their bright coloring warns large fish to avoid them. Benefit(s): Within its home range, the red-eared slider fills an important ecological niche as both food item and predator. Outside its home range, it fills the same types of niches, and is becoming an important food source for opportunistic predators in urban and suburban areas. Due to its own adaptability, it has become the predominant turtle species in urban environments; most city parks throughout the United States have their own thriving populations of red-eared sliders for the populous to enjoy. Threat(s): This slider, more than other subspecies of pond slider, is aggressive and bold, and competes for food and space with native turtle species. Being larger than most native turtles, it has a double advantage; the females can lay more eggs than the smaller native females, and because of their size, they are more desirable to native male turtles, and draw attention away from native females. Slider turtles, the southern species, are very closely related to painted turtles, the northern species; courtship and mating rituals are very similar, and when thrown together, interbreeding can occur, diluting the native gene pool. Slider turtles, especially former pets, can also carry unusual pathogens to their new environment, which can do great damage apart from the turtles themselves. Control Level Diagnosis: As adaptable as this turtle is, it does have its limits. Having developed in the southern United States, where the winters are mild, the species is simply not able to handle the harsh, cold winters of the far northern United States and Canada, which the native painted turtles can. Limited hibernation ability restricts their survival capabilities, keeping the red-eared slider limited in the United States to those states, and portions of states, where the winters are milder. Inside the United States, especially in urban areas, it makes no sense to try to control them; they have already out competed the native turtles in these areas, and taken their places in the food chain. The story in Europe and Asia is different. There are worries that the red-eared slider will become the dominant turtle in both these areas, unless they are controlled, and quickly; given how they have taken over suitable areas in the United States, this fear is valid. Due to the fact that most, if not all, reports from abroad were in different languages, the author was unable to discover whether action was being taken in these areas. Control Method: The only way to control these turtles, short of poisoning whole lakes, is through hunting, trapping, and collecting eggs and hatchlings. Oddly enough, these methods have proved so effective that there is some worry that overhunting within its home range is leading to a decline in the species where it is supposed to be. It is important to keep in mind, however, that public outcry at any attempt at control is likely to be enormous. A better solution to population control in urban areas would be capture- sterilization- release. Due to the longevity of these turtles, this would take a long time to work, especially since more are constantly being introduced into these same lakes by the public. The project would be an ongoing one.